G. W. Offley (Greensbury Washington), b. 1808. A Narrative of the Life and Labors of the Rev. G. W. Offley, a Colored Man, Local Preacher and Missionary; Who Lived Twenty-Seven Years at the South and Twenty-Three at the North; Who Never Went to School a Day in His Life, and Only Commenced to Learn His Letters When Nineteen Years and Eight Months Old; the Emancipation of His Mother and Her Three Children; How He Learned to Read While Living in a Slave State, and Supported Himself from the Time He Was Nine Years Old Until He Was Twenty-One. A Narrative of the Life and Labors of the Rev. 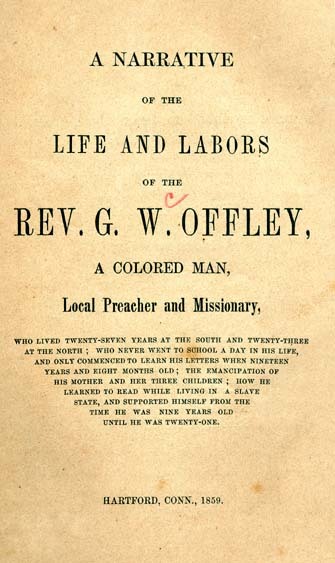 G. W. Offley, a Colored Man, Local Preacher and Missionary; Who Lived Twenty-Seven Years at the South and Twenty-Three at the North; Who Never Went to School a Day in His Life, and Only Commenced to Learn His Letters When Nineteen Years and Eight Months Old; the Emancipation of His Mother and Her Three Children; How He Learned to Read While Living in a Slave State, and Supported Himself from the Time He Was Nine Years Old Until He Was Twenty-One. Hartford, Conn.: [s. n.], 1859.